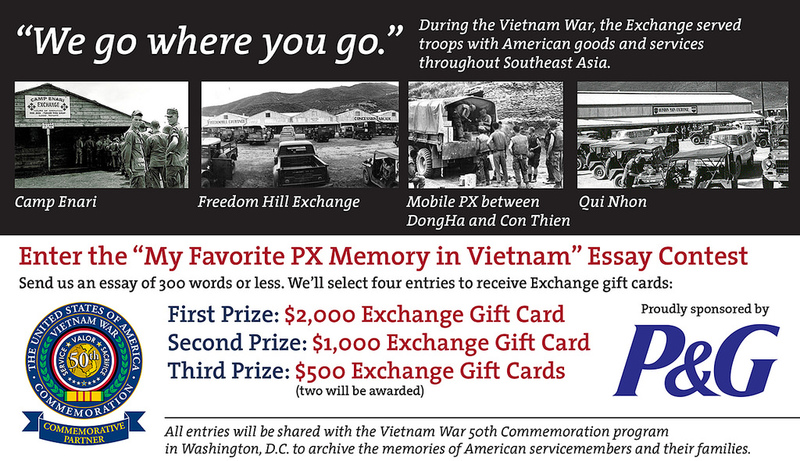 DALLAS – The Army & Air Force Exchange Service, along with Procter & Gamble, are commemorating the 50th anniversary of the Vietnam War with an essay contest that provides Vietnam veterans and family members an opportunity to share memories of their local PX/BX experience overseas or back home during the Vietnam War. Exchange gift cards totaling $4,000 will be awarded to four winners. One grand-prize winner will receive a $2,000 gift card, one second-place winner will receive a $1,000 gift card and two third-place winners will each receive $500 gift cards. From now until Nov. 21, authorized Exchange customers 18 years or older can submit their essay of 300 words or less by email to patriotfamily@aafes.com. Entries must include full name (including middle initial), mailing address, email address and telephone number. 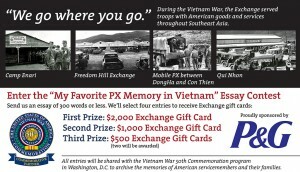 For complete rules and details, visit https://www.shopmyexchange.com/patriot-family. This entry was posted on Friday, October 31st, 2014 at 09:27	and is filed under Press Release. You can follow any responses to this entry through the RSS 2.0 feed.